Regardless of the title given to it - whether it be Cause and Effect, Action and Reaction, Sowing and Reaping, Karma, or any other - it may be considered the most fundamental of all phenomena. Put simply, each and every occurrence that transpires is ultimately the outcome of some sequence of Cause and Effect, whether it be on the scale of the cosmos, or on the level of some sub-atomic particle, or anywhere in-between. Such is the ultimate and sensible conclusion reached by many of the wisest individuals who have ever passed this way, who have sought to reach the heart of the matter. And, arising out of their investigations, it has been found and is generally agreed that Cause and Effect is not a random and unpredictable occurrence, but rather, it has its foundation in a universal law, which - like all other universal laws - cannot be contravened or set aside. Even if at some moment we might not comprehend all the factors that contributed towards the production of the sequence, it may be considered an axiom - a truth from which no-one can exempt themselves - that no Effect can ever present itself in the physical universe, without the establishment of the Cause, with which it corresponds or matches. This is of supreme importance, such that anyone who may be encountering it for the first time would do themselves a great favour, by giving that axiom a prominent and permanent place in their memory. It should also be borne in mind that Cause and Effect is not necessarily a one-time occurrence. Those same investigations mentioned previously have, in their respective ways, discovered that there are at least two levels of causation - aptly named First or Primary Causation, and Secondary Causation. As the title implies, Primary Causation is the starting-point of all outward manifestation, which, from the previous discourses, is ultimately traceable back to the Thought or Mental Action of the Original Creative Power (Spirit, Universal Mind, GOD, or, as it is sometimes called, First Cause). The Effect or Condition that may ultimately be produced by the action of Primary Causation, might, in many (if not all) instances, act as a causative agent in its turn, and lead to the production of further effects, but it must be borne in mind, that an Effect, when acting as a causative agent, is a Secondary Cause, as opposed to the Originating or First Cause. And the action of any Secondary Cause may also produce one or more Effects, which become secondary causative agents in their turn, thus giving rise to a train of Secondary Causation which, both in theory and in practice, could progress, ad infinitum. 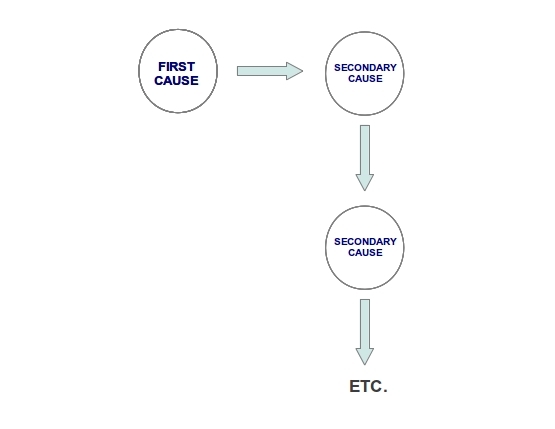 One noted authority on the subject illustrated the relation between Cause and Effect in this way. If, for example, a light source is brought into an enclosed room, the room becomes illuminated, and if the light source be removed or extinguished, the room becomes dark. The light source may be considered the Cause or primary causative agent. The illumination in turn may be considered an Effect resulting from the presence of the light, while the darkness represents the Effect resulting from the absence of the light. "Ex nihilo nihil fit" - "Nothing comes from nothing." If the reader would sincerely attempt to think the matter through for themself, they would inevitably come to the conclusion, that it could not be otherwise. And there is, so-to-say, an aspect of Primary or First Cause, that is related to the individual. It has been mentioned before, in the discussion on Mind Power that the human being - or rather, the human mind, which is the essential entity that constitutes the human being, as opposed to the physical body - is an Individualization, or miniature reproduction of the Universal Mind. Consequently, the exercise of Thought or Mental Action by the individual mind, can be aptly described as the Universal Mind or First Cause, operating in and through the individual mind, and thereby leading to the production of various Effects in the individual world, or Microcosm. This mode of operation of First Cause may therefore be aptly described as "Relative" First Cause, or the power of Primary Causation, manifested by an individual. Much of what has been previously stated concerning Cause and Effect has a very important bearing on the relationship between Thought or Mental Action and Material Results - both on an individual basis, as well as on a collective one. From the discussion on Mind Power, it was also mentioned that Thinking or Mental Action is a perpetual process - in other words, Thought or Mental Action is always setting some creative sequence into operation, whether that sequence be on the scale of the Macrocosm (entire Universe) or on that of the Microcosm (individual world). In like manner, the reader would have been presented with the postulation in the discourse on As A Man Thinketh that the same creative power which is exhibited by Universal Mind is equally present in the Individual Mind - also, that Man can never ever divest his thought of this inherent creative ability. 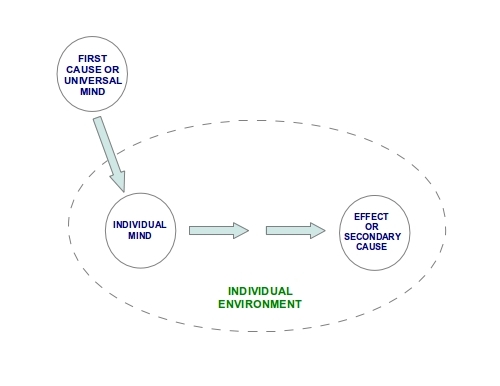 As a consequence, each and every person is - either consciously or unconsciously - implementing Relative First Cause, and consequently some sequence of Cause and Effect into motion - whether in their individual world, or in the collective world of the entire race. Some, if not all, of the so-called "basic" mechanics, regarding the action of what might be called the collective human consciousness, have also been mentioned in the discourse of Anima Mundi where it was stated that each and every individualized mind is - once again, either consciously or unconsciously - impressing some idea upon Anima Mundi (the "Soul Of The Universe"). And, if this point has not been stated before, it is stated now - the operation of Cause and Effect takes place, irrespective of whether the individual has any knowledge of the subject. 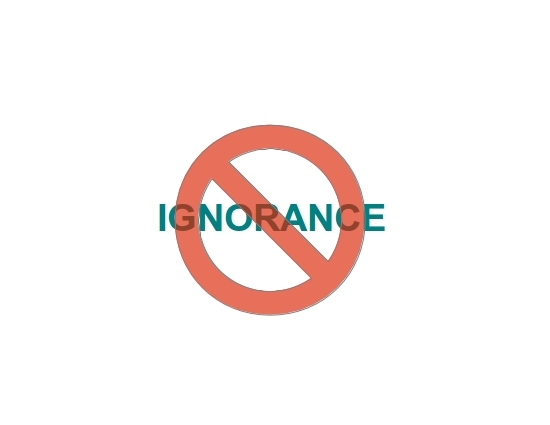 This is succintly summed up in a maxim, which is popularly expressed by the Latin phrase: "ignorantia legis neminem excusat" - ignorance of the law does not excuse anyone from its operation. This is a maxim which is equally applicable to the laws established by human society, as to each and every so-called universal law. And while there may be instances of exceptions to this maxim, as being applicable to "human" laws, the reader is free to investigate for themselves, or simply take it as an established fact, that Universal Law is subject to no exceptions. Consequently, it is possible to establish a clear, reasonable and substantial argument that each and every condition that is present in the physical or objective world - whether from the individual standpoint, or the collective standpoint - is nothing else but an Effect, which corresponds to a particular Cause. Accordingly, another argument can be established that each and every person actually has the ability and power to choose to consciously and deliberately direct the working of Cause and Effect, relative to their own individual world, towards some worthy end. If he or she fails or neglects to exercise such a choice, the only option left to the person is to accept whatsoever result or results that present themselves - whether those results be desired or undesired. In a subsequent discussion, the idea of exercising conscious and deliberate direction of the operation of Cause and Effect shall be put before the visitor.